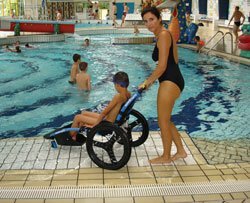 Zoom has a unique design: • The chassis is linked which means all wheels are in continuous contact with the ground- with the same down force and grip on all wheels regardless of the terrain. The vehicle can typically climb obstacles up to 20cm tall. 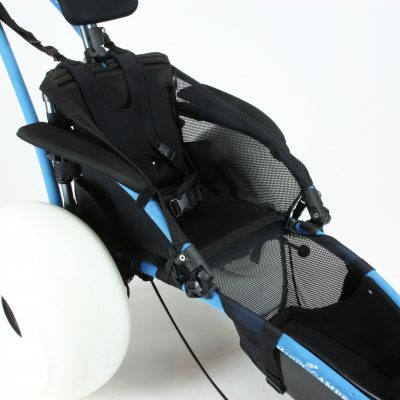 The chassis design makes the Zoom to compensate for uneven surfaces by about 25% as experienced by the rider. The motors are located inside the wheel hubs. This contributes to a low center of gravity and provides continuous four-wheel operation. The motors have a combined torque of 210 Nm, which provides superior power in rough terrain. • The wheels are cambered to increase stability, and cornering performance. • The tires are narrow and cross patterned to provide traction on soft surface such as snow and sand. • The battery pack consists of 2 LiFePO4 48 V/10 Ah units in parallel. • The weight is onl68kgs. The wheels have a differentiated asymmetrical wheelbase on each side. 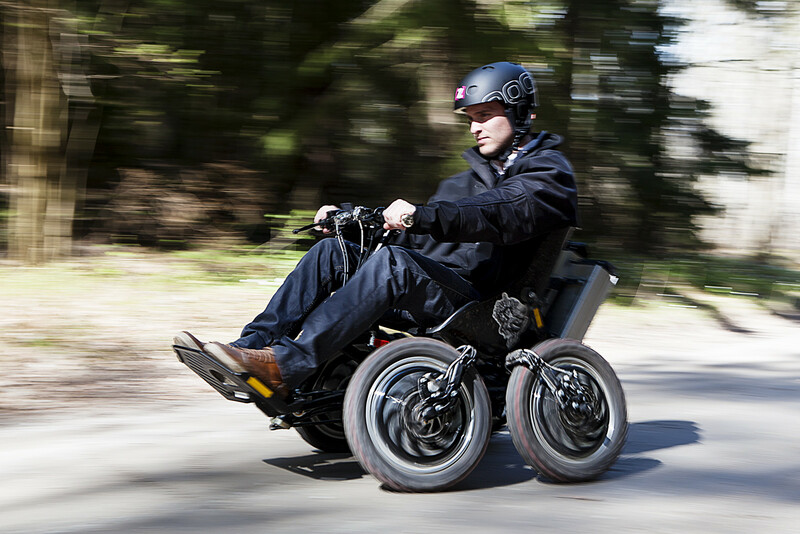 The wheel placement in combination with the linked frame and absence of suspension provides very low rolling friction to the ground, and contributes to superior traction and good battery economy. • The seat is reclined to give a comfortable ride and to minimize spine compression when driving off road. Technical [Specification] • Permanent symmetrical [4-wheel drive]? • Hub motors: [forward/reverse]? • Speed:20km/h] • Acceleration: 20km/h in approximately 2 seconds • Torque: 4 x 52,5 NM [210 NM] • Power: 4 x 1000 W [4 kW] • Batteries: 2 x 48V / 10Ah LiFePO4 Battery Cells. Detachable, rechargeable. • Number of charging cycles per battery: [> 800] • Charge time: About 2-4 hours • Range: Theoretical ma40km on one charge, on smooth surfaces and even throttle use. Range is dependent on rider weight, surface type, terrain and riding style. In terrain it typically run for 19-27 km on a fully charged battery. Plan all rides with a good safety margin. • Aluminum wheels? • Frame: Steel? • Black mudguards • Weight:68kgs.] • Length with foot plate folded for transportation:119cm] • Length with foot plate in riding position:135cms] • Height with steering lowered: 76cms] • Width:76cms] • Track width, center/center:76cms]? • Ground clearance:17.5cms] • Tires 16×2.5” air-rubber tire with motocross tread pattern? • Speed control: Motorcycle-style twist grip on right side. • Brakes: Two-circuit hydraulic, disk brake system? • Cruise control? • Recommended maximum weight of driver:100kgs] • Minimum age of driver [16 years] • Adjustable telescope steering column and 3 positions for the seat and foot plate.